Yellow starthistle (Centaurea solstitialis) is a “wanted” weed in the Merced River Canyon of Yosemite National Park and lower watershed. The plant is well known for its ability to dominate vegetation in the Sierra Nevada foothills and mountains, infesting an estimated 10 to 14 million acres in California. “The largest infestation of yellow starthistle in Yosemite National Park is near the western border adjoining Sierra National Forest land,” explains Garrett Dickman, Invasive Plant Manager with Yosemite National Park. “We are fortunate that yellow starthistle infests only about 18 net acres in Yosemite, but these infestations are scattered over about 250 acres of steep canyon terrain, making control very difficult.” Downstream from the Park boundary additional acreage is infested with yellow starthistle on lands managed by the Bureau of Land Management (BLM) and Forest Service (USFS). Various federal agencies and groups have worked to control yellow starthistle in the Merced River Canyon since 1998; however, control efforts accelerated in 2011 to include 18 contiguous miles of the canyon. 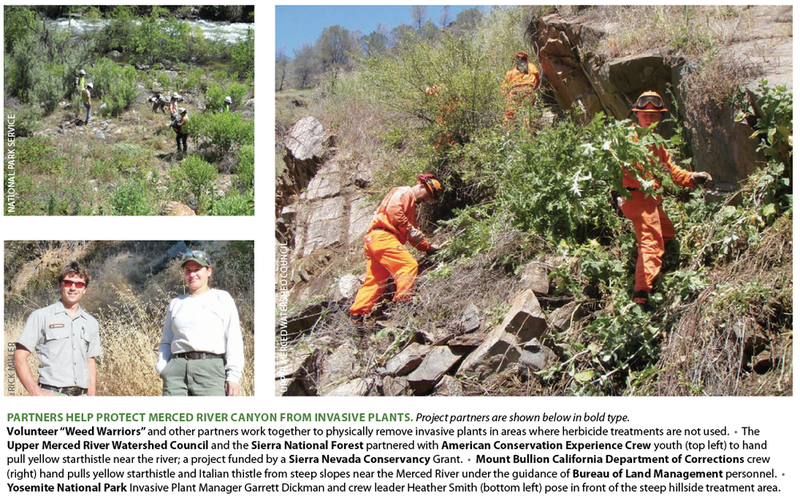 Three federal agencies—National Park Service (NPS), Forest Service, and BLM—partnered to share expertise and resources to control non-native invasive plants that threaten the Merced River Canyon’s renowned wildflowers, wildlife and recreation areas. Yellow starthistle management includes hand pulling, mowing, and herbicide treatments depending on site location and conditions. Yosemite National Park has two five-person crews—led by Heather Smith and Aaron Peters — that control yellow starthistle-infested sites within the Park and also contract herbicide applications to control yellow starthistle and other invasive plants on adjoining Forest Service and BLM land. Milestone® at 5 to 7 fluid ounces per acre (fl oz/A) is applied within the Park, and Transline® or Roundup* is used on other federal partner lands. “In El Portal on the west side of Yosemite National Park, infestations of yellow starthistle have been controlled with Milestone or Roundup depending on location and plant phenology since 2009,” explains Dickman. This area is the leading edge of yellow starthistle in the Merced River Canyon, and infestations are found on slopes ranging from 30 to 60 degrees. Crews use ropes for fall protection on the steepest slopes or drag hose-lines up to 400 feet to treat infestations on upper canyon slopes and hilltops. Smaller bluffs and rock outcrops along the highway have successfully been treated from a cherry picker type lift. The BLM also believes that spending less time on re-treatment frees up resources and allows crews time to detect and remove newly invading plants before infestations become established. Botanists monitoring herbicide-treated yellow starthistle sites have seen an increase in native plant cover on sites where native seed is present. BLM and Forest Service field crews, California Department of Corrections crews, and volunteers physically remove weeds from some sites. Consistent hand pulling and mowing has significantly reduced yellow starthistle within designated areas of the Merced River Canyon including along the Wild and Scenic Trail. In the wild section of the Wild and Scenic River corridor where hand pulling crews have removed yellow starthistle for six years, it takes only one day to pull plants compared to five days when the project first started. Monitoring data shows a 34 and 42 percent decline in Italian thistle (Carduus pycnocephalus) and yellow starthistle respectively, after three consecutive years of hand pulling. Timed mowing when plants are at about three percent bloom has also reduced seed production on roadsides and trailheads. Partners found that herbicide treatments were the most reasonable option for successfully controlling the largest infestations of yellow starthistle and could be combined with other methods such as hand removal once plant density was reduced. Table 1. The number of canopy acres treated within the yellow starthistle project area with herbicide on National Park Service, Bureau of Land Management, and US Forest Service lands since 2009. And, their hard work is paying dividends. Within Yosemite National Park, yellow starthistle acres treated with herbicide declined 41 percent from 2010 to 2011. Although yellow starthistle seed remains viable in the soil for at least six years, treatment of new infestations and monitoring and control of re-invading plants is resulting in a significant decline in infestations (Table 1). On Forest Service lands, the increase in acres treated between 2010 and 2012 was due to crews expanding treatment to previously non-treated infestations. Partners plan to continue interagency (USFS-BLM-NPS) cooperation in the future. Partners understand that their success in managing invasive plants is based on their commitment and funding to support future projects. Although staff and funding for invasive plant management remains limited, pooling resources has expanded management effort within the project area. ®™Trademark of The Dow Chemical Company (“Dow”) or an affiliated company of Dow. Milestone is not registered for sale or use in all states. Contact your state pesticide regulatory agency to determine if a product is registered for sale or use in your state. Label precautions apply to forage treated with Milestone and to manure from animals that have consumed treated forage within the last three days. Consult the label for full details. State restrictions on the sale and use of Transline and Accord XRT II apply. Consult the label before purchase or use for full details. Always read and follow label instructions. Active ingredients for herbicide products mentioned in this article: Milestone (aminopyralid); Transline (clopyralid); Roundup, Accord XRT II, Rodeo (glyphosate).